During the third quarter of the year, India witnessed the decline of the rupee, low import rates and high polymer prices, which are aggravating combinations that burden a challenged plastics industry. However, an exhaustive study undertaken by the Plastindia Foundation found that opportunities in the near term are available. This is because of the country’s large consumer base, an expected GDP upturn and the anticipated inflow of foreign investments, anchored to its surging demand for plastics. All these factors are expected to prop the domestic industry up, as India joins the league of the developed nations by 2020. PlastIndia Foundation, the apex body of major plastics industry groups in India, says that India has the competitive edge, to sum up the data presented in the study. 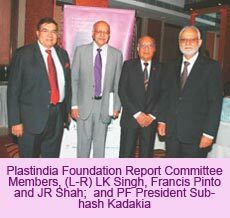 The Indian Plastics Industry Report 2012-2016 has been undertaken by a dedicated committee led by JR Shah, of Jayvee Organics & Polymers, who served as the convenor; and consultant Francis Pinto, who served as the Committee Chairperson. According to the report, the plastics industry grew by 13% annually in the last five years, and is expected to reach a double-digit growth by 2017. With most production and manufacturing activities shifting to Asia, given the economic growth in the region, India is a major player. Its huge consumer base – a population of 1.2 billion -- is four times larger than that of the US. It is also the third largest in terms of Purchase Power Parity (PPP), pegged close to US$5 trillion, and the 10th largest in the world by nominal GDP, based on World Bank data. Teeming with technical skilled manpower, its workforce population is of a productive age: 66% or 768 million are within the working age group with the median age of 24. In the next five years, investments will be flowing in, and could likely top US$10 billion. The robust production activity could achieve the productivity growth target of 8% by 2020 and this could also result in more than doubling the per capita GDP over the same period from the current levels. The nation’s lower than world average per capita consumption for plastics in 2012-2013 (9.7 kg) presents huge growth opportunities in the coming years. This will trigger strong demand for flexible packaging as well as requirement for new applications and innovations in packaging and thus will support domestic capacities, specifically for PE. In short, the local plastics industry would directly benefit from the increasing per capita income, rising consumerism and emerging lifestyles, particularly in urban India, says the report. 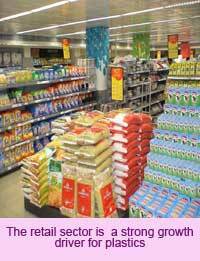 The retail sector is deemed as a strong growth driver, according to the report, thus giving rise to demand for packaging. India is anticipated to join in the ranks of top ten packaging consumers in the world by 2016 with demand projected to reach US$24 billion. Plastindia Foundation estimates that the sector’s consumption of PE will increase from 3.4 million tonnes from 2012-2013 to 4.9 million tonnes by 2017, reaching a 9.6% CAGR. For PET, the projected CAGR is 17% over the same period. Likewise, the Foundation also projects the potential for bottle grade PET for the Indian market. It estimates this sector to achieve a CAGR of 20% from 0.6 million tonnes from 2012-2013 to 1.25 million tonnes by 2017. This is based on the estimated per capita consumption of only 500 g in India as compared to world average of 2.7 kg and US consumption of 6.7 kg. PET water bottles fetch the highest percentage in plastics application for sector consumption at 21%, as opposed to the agro-chemicals sector at 2% of the 0.6 million tonnes value in 2012-2013. Likewise, the report says that thermoplastic polymer consumption will grow from 11 million tonnes in 2013 to a range of 16.2-20 million tonnes by 2020. The packaging industry is growing at 15% annually and is valued at US$15.6 billion; the flexible packaging industry accounts for 35% of the consumption, followed by industrial (14%), rigid packaging (13%), infrastructure (12%), consumer durables and lifestyle (10%), agriculture (9%) and automotive (3%). 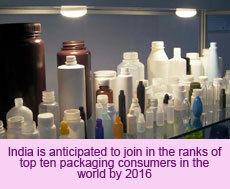 The healthcare sector, another growth area, also uses plastics for its packaging of medicines and devices. Increased consumption often results in increased wastes. Such is not the case for India, the committee assures. “The plastics industry is conscious of its responsibilities as the consumption increases” said Subash Kadakia, President, Plastindia Foundation. “Increasing capacity of plastics recycling is a priority. We are working closely with many authorities to increase the efficiency of waste management processes. Plastindia Foundation is continuously embarking upon education initiatives at various levels in our society” he added. The report indicated that the industry has about 3,500 organised recycling units; and about 4,000 unorganised ones, recycling major types of plastics such as PET, HDPE, PVC, LDPE/LLDPE, PP, PS, ABS and PMMA. Nearly 100% of rigid plastic products, except EPS are recycled. Identified areas where there are plastics recycling clusters are Dhoraji and Vapi in Gujarat, Daman, Malegaon (Dyana) and Sholapur in Maharashtra, Dharavi and Bhandup in Mumbai, Indore Madhya, Pradesh, and Delhi. The estimated bulk of recycled plastics is 4 million tonnes. India had the second highest collection rate for PET in 2012 (70%), after China (90%). With the increasing demand for plastic applications, consumption for polymers will proportionally increase. In the report, growth targets are indicated at 10.6% from 2012-2017; and 10.4% from 2017-2020. Nonetheless, for major polymers, the study finds that there is a disproportion of manufacturing capacities against consumption: From 2012-2013, the capacity is 10.4 million tonnes; whereas consumption is 11 million tonnes. From 2016-2017, capacity is expected to reach 15.2 million tonnes; and consumption is likely to reach 16.5 million tonnes. Conversely, from 2012-2013, the country exported US$2.77 billion worth of plastic raw materials, with China as its top market. Processed goods exports were valued at US$3.25 billion, with US as its largest market. Based on the Foundation’s estimates, demand for polymers will hike to 16.5 million tonnes by 2017 with a CAGR reaching 10.8%. Likewise, major manufacturing capacities of polymers during the same period are estimated to reach 15.2 million tonnes.